< Start your Western party off right by inviting your guests with western invitations. You can then hand out bandanas and novelty cowboy hats to make it an official western theme party. We have invitations of horses for cowgirl parties. You can browse and sort all of our Western party accessories here or use the search feature in the upper right hand corner. Gold Bars and Gold Coins are great western party supplies because you can use them as decorations and western party favors. Give your party guests a unique western favor bag when you fill up the canvas money bag with gold coins. Don't forget about the inflatable and balloons for the party, like the Inflatable Horse. This horse will be a great centerpiece for your main table or prop to sit on the ground. All of this Western Party Supplies will be a great addition to your party! Host a rodeo or western party with the help of PartyCheap.com. It doesn't take a lot, just a few well placed western theme decorations and you can give your party a western theme feel to it. 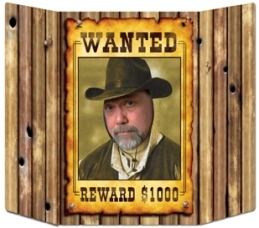 Or if you really want to transform your room for a western theme party get the Wild West Scene Setter or the Western Saloon Scene Setter to decorate your entire wall. We have all of the western decorations, cowboy hats, and western tableware you need for a rooting tooting western party. To create a truly memorable western party theme you need some of these little accents that make your western party different. Make you guests think they are walking into a OK-corral shootout when they see there are bullet holes all over your doors and walls. String up some Silver Barbed Wire that only looks painful to create your own cattle fence. Cowboy hats are a very traditional western party icon. But you don't just have to use them as costume accessories. Check out the mini plastic cowboy hats that include four to a package. This mini stetsons make great western table decorations or individual place setting. And speaking of western place settings, you will love the cute Cowboy Boot Photo/Balloon holder which pulls double duty as a table centerpiece or place-card holder, then give it to your guests as a western theme party favor so they can take it home and use it as a picture holder. You can't go wrong decorating with cowboy boots for a western theme party. Give your guests cowboy hat party favors or use them as table centerpieces. Your guests will also get a kick out of drinking out of a boot mug. A fun trophy to the best cowboy outfit of the night would be a silver cowbell. We also have Cow Bells in many colors. Cowboy playing cards and the paper play money are great for western party themes because you can incorporate them into a western party game. You can also hand out Metal Sheriff Badges and cowboy boot necklaces as party favors to your guests so even if they didn't dress up for your western party they will have something to wear to make them feel like they are involved with the party theme. And last but not least, send out western party invitations to round everyone up to head on over to your western theme party. You are sure to have a western blowout with all of our cheap western party supplies.